Bittersweet was the sentiment when I packed up my life and moved away from “Colorful Colorado” 10 years ago. On the one hand, I was eager to turn a new page, yet I was also sad to leave such a breathtakingly stunning outdoor playground. I especially tried to ignore my disappointment in knowing that my new Midwestern home in Chicago wouldn’t afford the same opportunities to partake in my favorite sport, skiing. Nonetheless, I wrapped up my beloved Atomic e7s and went on my way. Oftentimes, our attachments to outdated, albeit trustworthy, equipment seems practical, even necessary in our own personal justifications. It turned out to be several years before I got back out en piste, and for logistical purposes, I rented gear the next few times. Fast forward to this year, where a group of friends had planned a trip to Vermont over the MLK holiday weekend. I was especially thrilled to dig into the back of my closet and finally dust off my skis. When I brought them in for a tune up, I was told that my bindings were way out of warranty and unsafe to use, and that I’d be “a dinosaur” skiing on them. A dinosaur?! It seemed a little harsh considering skis are built to be incredibly rugged and to last for the long haul. I’m pretty sure the pair I had before those were from the ’80s. Sure, I should probably consider investing in new equipment at some point, but I’d spent years building up the anticipation to use my e7s again. Not to mention that mocking my darling pair of skis was not a particularly thoughtful sales technique. Had the rep been more delicate and calculated in his approach, he most definitely would have had me perusing their inventory. As I explained that I was absolutely in no position to purchase new yet and was simply trying to get up to the mountain that weekend, I settled for new bindings and a fresh wax and edge sharpening. I returned later that week to pick them up, and the techs expressed their surprise at how well everything turned out. When I hit the slopes that weekend, it was with a pair of old trusty friends underfoot. 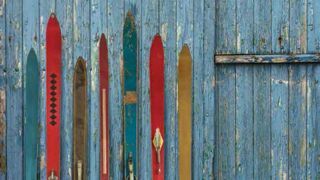 As the runs down memory lane progressed, the skis handled the terrain with aplomb. I was proud and amped up, yet I also found myself expending a lot more energy than I knew I should have. The long length, subtly curved shape, and heavy weight of the 15-year-old Atomic e7s most certainly had taken their toll by the end of the day. Oftentimes, our attachments to outdated, albeit trustworthy, equipment seems practical, even necessary in our own personal justifications. At the same time, getting to know what’s possible when embracing the latest innovations is a worthwhile endeavor. Now that I’ve had a last hurrah of sorts with my e7s, I feel ready to move on from them. The weekend also served to inform my perspective on what kind of a replacement I’d be best served by. As I’ve caught the ski bug hard again and plan my next Vermont excursion in February, I’m eager to actively explore and demo the latest gear in a pragmatic and informed manner. I guess it’s about time to embark on another fresh page.